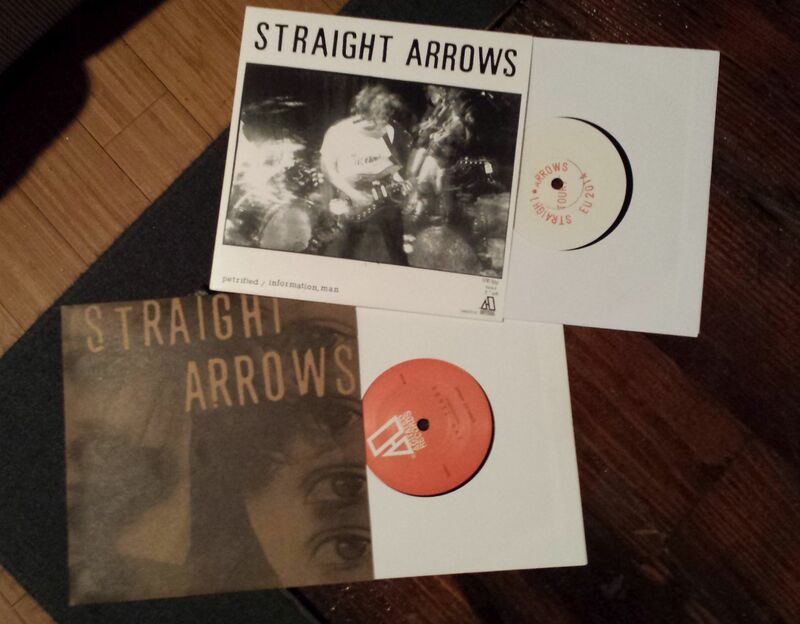 Prior to dropping 2014’s Rising, the STRAIGHT ARROWS released a 7″ with the album’s lead single. After the LP dropped they released a 7″ specifically for their ensuing European tour, and both included a previously unreleased B-side track. To celebrate our 5th birthday here at SD, we’ve got music to share that you really can’t hear anywhere else right now (unless you bought the wax, of course!). The singles we speak of both came courtesy of Agitated Records in the UK, and both are available in severely limited quantities. The first was released before their sophomore album and included the then brand-new single “Make Up Your Mind” backed with the B-side “Two Timer.” Housed in a sturdy cardboard sleeve, the 7″ came limited to an attainable 500 pieces, but unfortunately my personal copy was dished on one side which turned out to be a pressing fault (but the mp3 sounds fine). Whether or not this issue affects the rest of the records is a valid question, but since they’re still selling it, you should be fine. After releasing Rising and announcing their plans for a full tour across Europe, we also learned the band would be selling an entirely different 7″ at their shows. 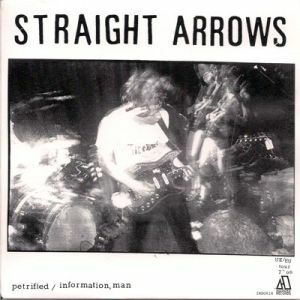 The tour 7″ gives their track “Petrified” a new home, not to mention a brand new B-side entitled “Information, Man.” The tour 7″ comes with plain white labels and is hand-stamped with track titles, slipped into a thin white sleeve with hand-written numbering (“FB 1809 9/30”) on the back. 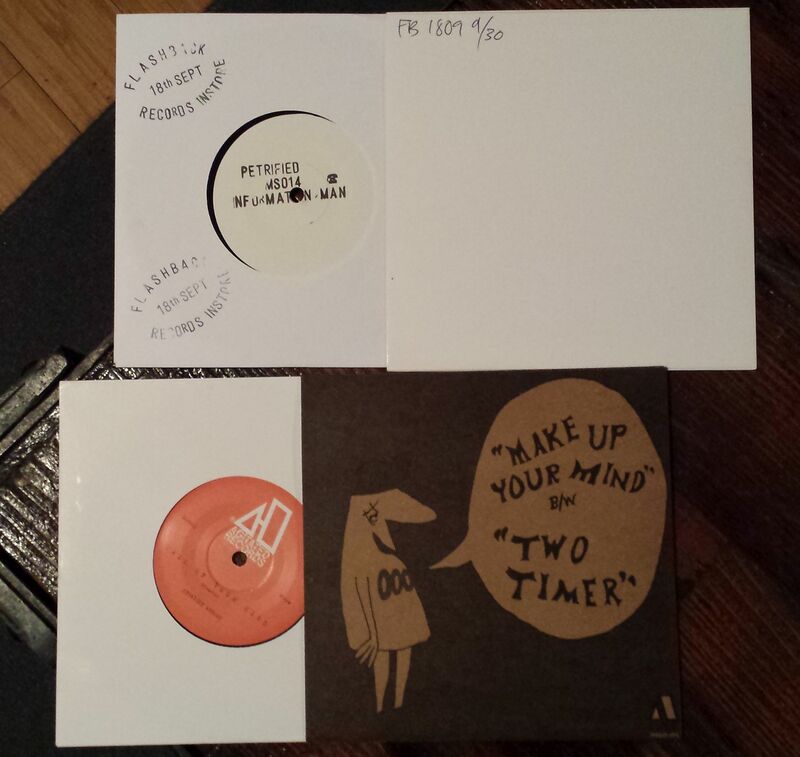 Unlike the first, this single is limited to just 300 copies. “Two Timer” is a bit of a slow-burner and it makes sense considering how quickly “Make Up Your Mind” unfolds. Jewel-toned guitar hooks go hand-in-hand with Owen Penglis’ scuzzy croon, creating an exceptionally concentrated anthem of tinny guitar pop. “Information, Man” contains an explosive mixture of guitar hookage and infectious melodies, held together by a rock-steady rhythm comprised of wonky bass lines and stomping percussion. Guitar hooks sound wrinkled and gritty, adding a particularly invigorating twang to this shocking B-side. The best news for you is that you can hear both of these B-sides right below (good luck elsewhere), so get to it (this is like our birthday present to you, as Styrofoam Drone is officially 5 years old today). 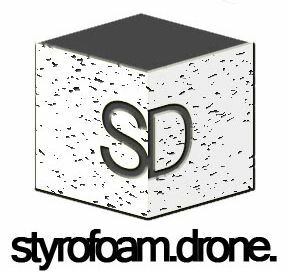 Posted on December 18, 2014 by styrofoamdronePosted in 7", Reviews, Still Spinnin'Tagged 2014, 7", Agitated Records, Information, Make Up Your Mind, Man, Petrified, Straight Arrows, Two Timer.